I am a lover of boots. Specifically – horse boots. Usually I don’t admit to being much of a tack ho, but boots are my weakness. If it weren’t for extreme self control, I’d have a million pairs. So when Horze contact me about reviewing their extremely popular tendon boots, I jumped at the chance. 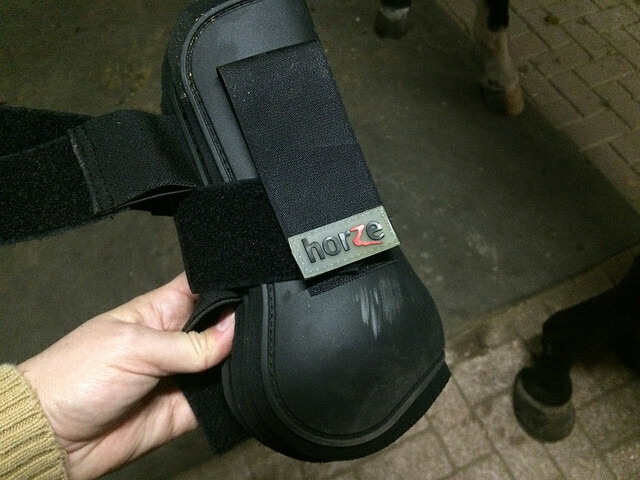 In the past I’ve ordered fancy fleece protection boots from Horze, and was happy with the quality. For me, sizing was an issue since some of their boots just come in horse size. Simon is a bit of a weird fit. 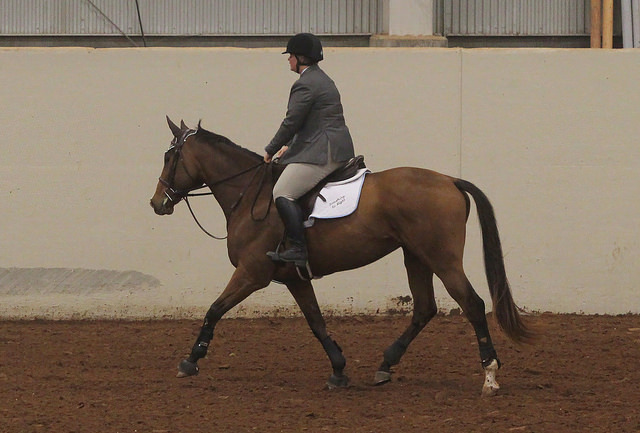 Even though he’s not tiny, horse stuff tends to dwarf him. 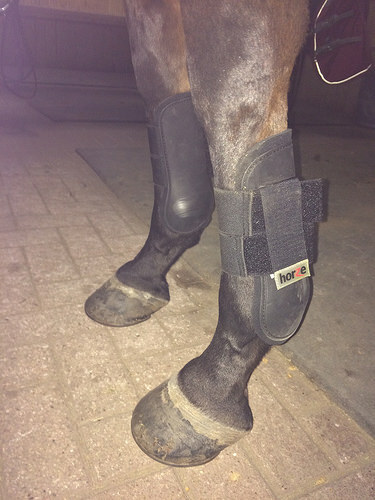 So I was pleased to see that the front tendon boots came in several sizes – Shetland, Pony, Cob and Full and tons of colors. Since I’m a boring hunter/jumper princess, I got black. Simon has been wearing these for several weeks in the picture, so they don’t look brand spanking new. That being said though, they are holding up well. The lining is nice, and there are no tears in the velcro or other stitching. Really the only noticeable mark is from us hitting a pole (you know, from my bad riding) and that would probably scrub off quite easily. Size wise on Simon, I feel like I could have gone with the horse size and been just fine. I’m also not an expert on open boot fitting… what do y’all think? Either way, the elastic has a lot of give. I would venture to say that the boots of each size will fit a wide variety of legs in either direction, because the straps are tight enough naturally that boots won’t slip down if you adjust correctly but at the same time they have a lot of give. After use, Simon’s legs weren’t overly hot or anything like that. 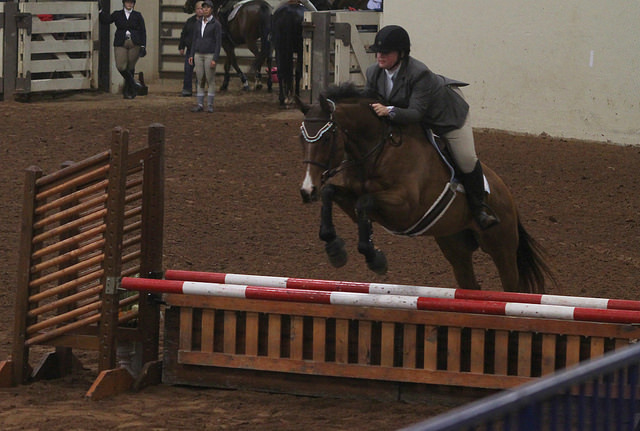 To me, the boots do what they’re supposed to – protect his legs with a smidge of tendon support when jumping. Now one of my big critiques of Horze products is the tendency to have huge branding on everything. In your hand, these boots appear to have the same problem with the big ‘Horze’ on the strap. For that, I have two responses. One – you can’t see it in the show ring. Seriously, these pictures were taken using the tendon boots and even with my mega zoom lens you can barely see the logo. Two – and I apologize to the marketing people at Horze, but you can always cut the logo off if you don’t like it. The logo is on the velcro that goes over your straps, and you can simply cut that part if it really bothers you. I wouldn’t let the branding turn you off on an otherwise great pair of boots. For the price, which is $26.95 (there are often flash sales), you really can’t beat these boots. Yes, they look like Eskadrons. Yes, they act like Eskadrons. Yes, they are much cheaper than Eskadron. I prefer these to the Dover “house” boots at the same price point. I might even be convinced to buy “wild” colors for funsies! 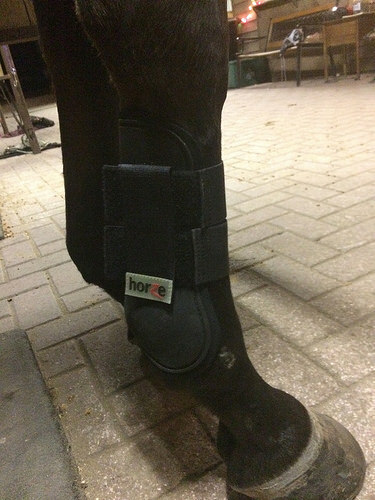 If you’re looking to quell your “need” for lots of horse boots like me, check out the Horze tendon boots and you won’t have to break the bank! Yay for boots! I’m the same way – I would own dozens of pairs if I had the cash haha. Those are really nice. I have an obsession with boots. I want to try the laval boots! I agree the branding is obnoxious, but understandable. I have these boots in a fun light purple. I love them. No complaints. I hose them off when I remember/when they are really dirty and they are magically clean again! I have been using them for about 3 months and there seem to be no signs of wear. The elastic is still tough and stretchy and everything inside and outside the boots is holding up. Cosmo does interfere quiet a bit, which is apparent from the scuff marks on the inside, so I am glad to have these. Secondly, in spite of detente between the USA and the Soviet Union, USA and China, the ideological rivalries between the socialist and the capitalist countries have still become more manifest. If your life isn’t where you want it to be, change it. It’s what successful people have done for thousands of years. You may currently be struggling and frustrated with your life but it’s not going to stay like this forever, that is, unless you don’t do anything to change it.